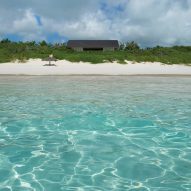 Architect Chad Oppenheim has built himself a getaway on a secluded three-mile-long island in the Bahamas, featuring a living room that extends onto a deck overlooking the water. 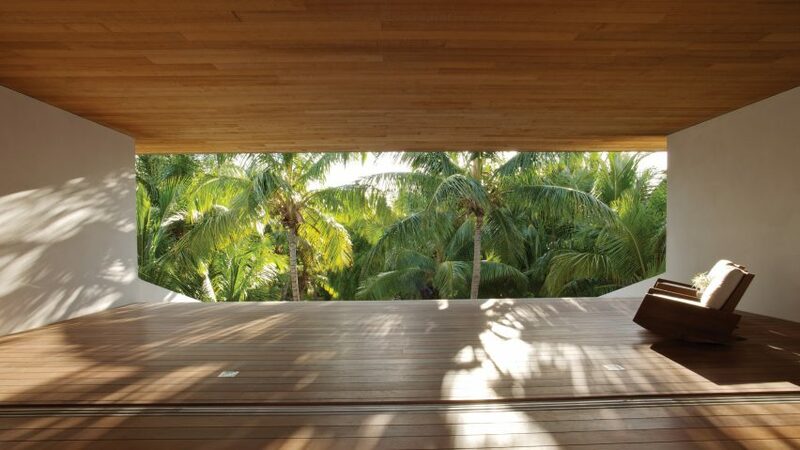 The architect led his Miami-based firm Oppenheim Architecture on the design of the retreat for himself and his wife Ilona. 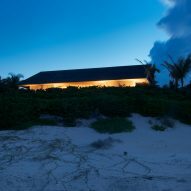 It is located on the tiny Harbour Island, just off the northern tip of the Bahamas' larger Eleuthera Island. The two-storey residence perches atop a sand bank, giving it the name House on a Dune, and is designed to make the most of views of the surrounding North Atlantic Ocean. Its simple rectangular floor plan places the main living area – including the dining room and lounge – at the centre of the top floor. 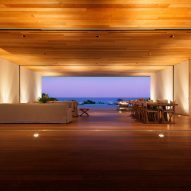 Sliding doors open the space entirely onto the two wooden decks either side. One of these verandas overlooks the water, with a staircase that leads straight down to the beach. The other is placed at the front of the residence, at the peak of grand entrance steps, which mount the slope of the dune and are surrounded by tropical greenery. When the doors are opened entirely, the size of the living area is tripled for entertaining guests, and sea air is allowed to flow through the house. 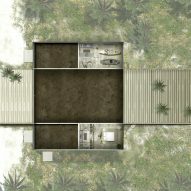 "The central space of the house is essentially an open breezeway, allowing visual and pedestrian connectivity across the site," said the studio. "Within this pavilion space there is the living and dining areas that open onto verandahs well protected from the elements by the deep overhangs of the gabled roof." Inside the residence, the kitchen is placed to one side of the living room and slots between a pair of matching guest bedrooms with en-suite bathrooms. Chad and Iona's master bedroom is situated at the opposite end, facing the water, and has a much larger en-suite bathroom with a wooden bathtub. A twin bedroom also occupies this side of the residence. A games room and another guest suite are placed on the floor below, nestled into the slope of the site. 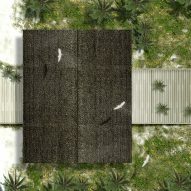 Chad chose a neutral material palette to blend in with the surrounding beach and tropical plants and trees, as well as the archipelago's vernacular architecture. 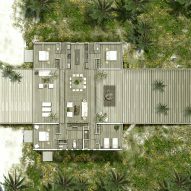 He said that one of the main challenges was the limited resources on the island, forcing his studio to source materials from others in the Bahamas and overseas. Their choices included cedar shakes – wooden versions of shingles – to cover the gabled roof and a pale plaster to coat the exterior concrete walls. White-painted surfaces inside are complemented by a host of wooden details, from cedar that lines the ceiling and darker ipe flooring. Wood also forms a lot of the furnishings, including a table made from a 250-year-old oak tree in living room. "From the neutral colour palette to the materials used to the decor, all design choices were made to establish a sincere, spiritual, contextually-sensitive dialogue with the indigenous island surroundings and to acknowledge the architectural heritage of the island," the studio said. "Furthermore, the use of environmentally-conscious materials was of paramount importance in minimising the home's overall impact on the native ecosystem." A dining table made of weathered teak, folding dining chairs by Mogens Koch, and a pale sofa are among the other furnishings. Oppenheim Architecture was founded in 1991 and is headquartered in Miami, with other offices in New York and Basel. Previous residences completed by the firm include a Miami Beach home adapted for tropical living and a quirky renovation of a chalet in Aspen. Photography is by Karen Fuchs.